According to the ancient books, there was an interplanetary civilization in our solar system before Jah created man. There even was a planet, known in the Bible as Rahab, from where this civilization was run. Rahab turned into the asteroid belt as the result of a judgement that came on this civilization. The planet Mars was completely destroyed, and so was earth. It should therefore not be a surprise to find evidence of this ancient civilization that even pre-dated mankind, and indeed we do find such evidence all around the planet but also on other planets. However, as strange as it may seem, more often than not the general public isn't told about such major discoveries, or the findings are simply downplayed. And so, researchers and NASA are often caught in a game to (un)cover material from the photographs taken on outer-worldly locations, such as the planet Mars. Pictures such as this one. 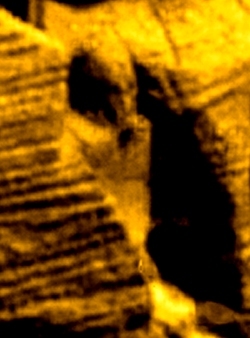 It seems to depict the statue of an ancient Egyptian Farao, caught in a Rock. The sight surely invites everyone to take a closer look and should the photograph have been taken on our planet, we would have send a team of archeologists.. It doesn't matter. They say there's not much air to breath on Mars, and that's exactly where this picture is taken. Click on it, or HERE, to read a thread on the ABOVETOPSECRET.com Website and see for yourself.